After an ever so brief week off from school, los ninos are returning today for Summer School. Now, I don’t know about you, but when I was a kid, summer school was for…well…the less than bright students. It was for catching up and passing subjects that were failed during the school year, so you would be able to progress with your classmates to the next grade level. Was that the way it was for everyone else? Well now, Summer School is like summer camp! The kids have classes with Legos and magic tricks and even an entire class dedicated to Dr Seuss. There are daily prizes given out by random, and an attendance price for each child at the end of the roughly four week session. The kids get paid. They get a gift card with $60 a pop for perfect attendance. It was $100 a kid a few years ago. What the what?! I am envious! I would have loved this program when I was a kid! My mom wouldn’t even let me join Girl Scouts, to say I was a bored child would be an understatement. So, today it’s just me and the littles. Matt and Bella are having awesome adventures at school and earning money while they’re at it. Lucky little brats. 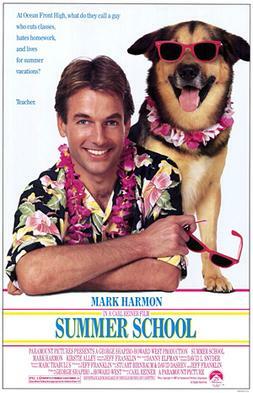 I can’t leave this post without adding that Summer School was an AWESOME 80’s movie! Mark Harmon, Courtney Thorne-Smith, Kirstie Alley, Chainsaw, omg, I love me some cheesy 80’s movies!